I don't know what it is about stop-motion animation, but there is a skill to it that I find fascinating. The method of creating puppets and then magically shooting them talking and moving for a camera is incredibly cool to me. You can believe me when I say watching animation is cool, but something about stop-motion seems to me like one needs a certain skill set to do it, and it never seems like something anybody can do. Focus Pictures made a bold statement back in 2009 with "Coraline," the best stop-motion film in recent years. There was an energy to the film that was undeniable. There was a style to that movie that was magnificent to watch, an energy that completely captivated me. It also featured a story that engaged me, which seems very rare in a world where Pixar and Dreamworks are taking it easy. There was a lot to love about "Coraline," and as I saw "The Boxtrolls" play out tonight, I was hoping for the same thing to happen once again. Sure, nothing happens the same way twice, and I have come that this is especially true with movies. 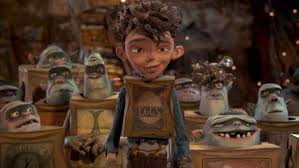 But overall, I found myself thoroughly enjoying "The Boxtrolls." The film takes place in a fictional town called Cheesebridge in the early 1800's. It is a cheese farming town that seems to be overrun by trolls. They are not just any type of troll, they live in boxes so that they can better hide themselves from the humans that occupy Cheesebridge. The folk of Cheesebridge believe that trolls kidnap and eat children. A man by the name of Archibald Snatcher vows to the mayor to kill every troll in the city, as long as he can join The White Hats afterward, which is a cheese-loving council in the city. The trolls like to get out at night and cause mischief, but it is all harmless, the trolls don't really kidnap babies and eat them. When a baby is accidently given to them, the trolls as a team take care and raise the child, giving him the name Eggs (which is the name of the box he inhabits.) They boy believes he is a troll simply because he never knew better. Once Archibald really begins to crack down on the trolls, Eggs begins to question why they always run away from the humans, and he vows to rescue all the trolls that Archibald has taken in. What I liked about the movie how good the animation was. The attention to detail is so crisp and so slick that I felt the world grasp me. The use of day and night is superb as is the use of fog in some points of the film. The way characters sweat is also a small yet striking point I have never noticed before. The animation in this film is greatly top-notch. The film features a wonderful cast that includes Sir Ben Kingsley, Elle Fanning, Simon Pegg, Jared Harris and Toni Collette, all great actors. As they delivered dialoge, I could not tell it was them, I thought this film was all unknown voice actors, not all A-listers, it was something that surprised me in a big way. The film has lots of silly moments which I am sure the kids will like. What surprised me though is how the film deals with themes of identity and family. I was shocked how seriously the film took them and how well they were able to highlight them. This is a rare family film that I feel anybody of any age could embrace. While I don't think the end quite works and I think the film gets a little too long (or at the very least, feels long.) This is another hit for Focus Pictures. If they keep playing their cards right, they could easily create real competition with Pixar and DreamWorks.